It sure beats the 200-300kbps I have been getting for the past few weeks. What'd you get to Auckland and Wellington? I didn't bother testing to the Wellington server, but it should be similar I would have thought. So the question is, are Xnet going to do the right thing by their customers, as did Xtra with the Go Large debacle? 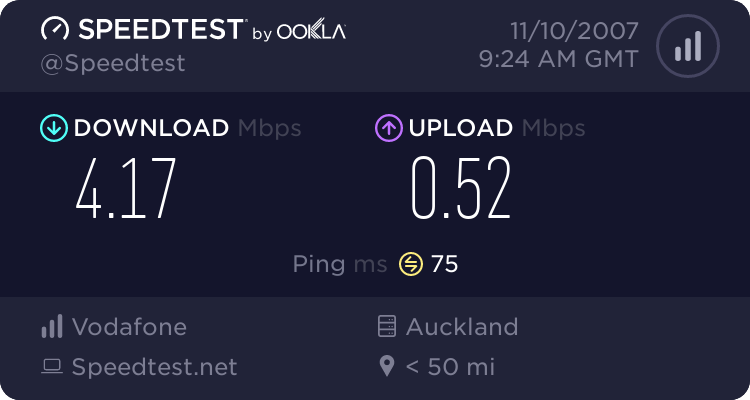 We've experienced virtually unusable international speeds for the last 8 weeks or so - the only difference between this situation and Xtra's is the amount of media coverage. MikeGayner: So the question is, are Xnet going to do the right thing by their customers, as did Xtra with the Go Large debacle? We've experienced virtually unusable international speeds for the last 8 weeks or so - the only difference between this situation and Xtra's is the amount of media coverage. I do not agree. It must have depended upon which area you are in and which exchange you used. My speed dropped to 50%, but that was still just under 2Mbps. You would have to see who and how many people were affected significantly before saying everyone gets a credit. MikeGayner: We've experienced virtually unusable international speeds for the last 8 weeks or so - the only difference between this situation and Xtra's is the amount of media coverage. National speeds were still perfectly fine and while 200-300kbps International speeds were less than ideal, my YouTube videos still played, albeit after waiting for the buffer to fill up a bit. And keep in mind too, that the off-peak performance of International was still OK too. It was only during the evening hours that International slowed down. I don't believe you could fairly categorise the above situation as an outage and in any case, other ISPs such as Orcon, iHUG etc have been/still are suffering from the same problem and no one is pointing the finger at them. The reason GoLarge users were given credits, was not because of the slow speeds per se, but because they told everyone what protocols they were filtering, and it turned out they mis stated those, and were actually slowing all types of traffic down. Your experiences may vary of course, but this usually growchy, ISP hating person has a strangely large amount of karma for xnet. Have you all really had problems with your international speeds for the last 8 weeks? Now it would have been nice to have known there were these simular issues at Xnet when making the decision to change over, but are you all now stating that these speed issues seem to be resolved? Yeah, that puts the situation nicely into perspective I think. For the first few years I had full-speed JetStream (1999 till about 2001) I don't remember ever getting more than about 250kbps throughput on connections to the USA. 1Mbps was the best I ever got to Aussie as well. During that time, Xtra was my ISP. More recently we also got speeds above 1Mbps to the USA when Paradise was our ISP for around 2 years. TheBartender: Have you all really had problems with your international speeds for the last 8 weeks? Keep in mind that it was only at night, not 24/7 as seems to have been the case at Woosh. TheBartender: ...are you all now stating that these speed issues seem to be resolved? WxC stated that they had an unusual number of new customers, so probably mostly the Woosh guys changing over? They also said something about having upgraded the backplane from some very slow speed to some very fast speed (I'm working, can't waste time looking it up) so I would guess they wanted to upgrade for some time but simply could not justify it and had to wait for more customers and "problem" before justifying the expense. And they also said there were delays in shipping the equipment. And I do believe them when they say they did not want to let the opposition know what they were up to, as it is now too late for the opposition to catch up before Christmas holidays when lots of people might think of switching over from dial-up to broadband. In Pakuranga, Auckland I was still getting almost 2Mbps at night. And my VFX calls were still as good as it was before. It is now sitting at about 3.6Mbps, what it was before. I will not complain until it drops below 1Mbps. Believe it or not, but I think they were higher than the sub 500kbps speedtests that were posted earlier. 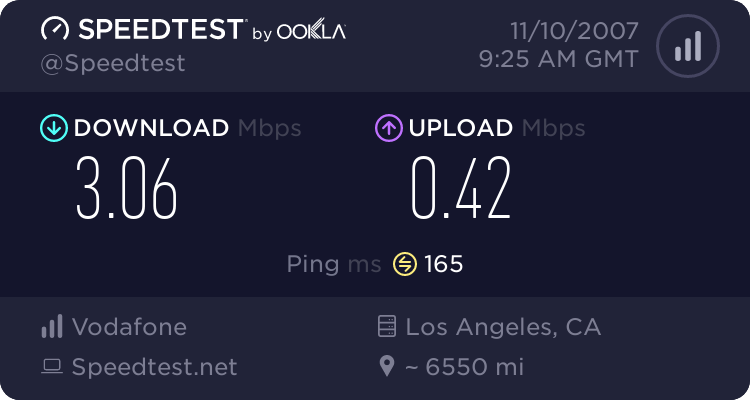 Well i dunno about you guys but i just did a speed test to L.A and only got 708kbps. I must say that is better then what it was a couple of weeks ago but still isn't as fast as it once was. Must still vary between locations.